Comments: Brand new stock-laminated Quick Study Barcharts left over from store closing. Great study aid at a great price ready to ship! The latest addition to our popular line of chemistry titles. This guide is packed with useful and up-to-date information. 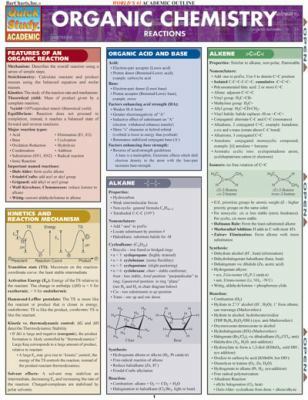 ;Topics covered include: - features of an organic reaction - kinetics & reaction mechanism - organic acid & base - benzene/arene, alkyne & alcohol - aromatic alcohol & haloalkane - halohydrin & ether - aldehyde & ketone - carboxylic acid & ester - amine & amide acid - organic polymer - and much more...Jackson, Mark is the author of 'Organic Chemistry Reactions' with ISBN 9781572225893 and ISBN 1572225890. Loading marketplace prices 7 copies from $1.49 How does the rental process work?